I made you a cake. I figured it was the least I could do since I essentially vanished for the past 6 months. 2016 was an amazing year which kept me very busy, but also too busy to spend much time here. This year I am striving to strike a bit more balance. Realistically, I won't be posting 5 days a week as I once did, but I will try to be a bit more consistent. On to the cake. You're going to LOVE it. This cake is moist (read buttery) and full of flavor. The saffron adds just a hint of something that will keep most people guessing. The cardamom glaze puts it right over the top. The two flavors together are perfection. Blackberries and almonds round out the profile and add a bit of texture creating just the right balance. See? Balance. This cake started more as a joke than a post. I am updating my portfolio over this month and trying to fill in some gaps with new photos. I wanted to make a bundt, but didn't know what kind. I thought of figs (mostly because they're beautiful) and then it hit me - I.. like... fig bundts and I cannot lie. I know it's corny, but I'm a middle aged dad and that's my duty. I became obsessed with the idea and started looking for great looking fresh figs. That did not work. Nevertheless, I had already settled on the bundt idea and needed some different inspiration. The result is here, in all its delicious glory. Bundt pans are great. They produce slices of cake that have a higher crust to cake ratio than typical pans and make beautiful displays. However, if the proper steps are not taken, the results can be disastrous. Be sure to liberally grease and dust the pan before beginning, even non-stick pans. I used butterscotch liqueur to dissolve the saffron, but you could use a different liquor such as rum or Licor 43. Stick with something with a sugar and/or vanilla base for best results. Grind saffron threads and 1 teaspoon of sugar together in a pestle and mortar. Add the ground mixture to a small bowl and add liqueur. Stir to combine and cover with plastic wrap. Allow saffron to rest and dissolve for at least one hour before proceeding. Preheat oven to 350˚F. Liberally grease a bundt pan which can hold at least 4-5 cups of batter. Dust with flour and set aside. Melt butter in a small saucepan over medium heat. Add milk and saffron mixture. Stir to combine and set aside to cool slightly. Add eggs and remaining 1¼ cups sugar to a mixing bowl. Beat on medium high speed until light and fluffy. Add butter mixture and beat until combined. Add flour and beat until fully combined. 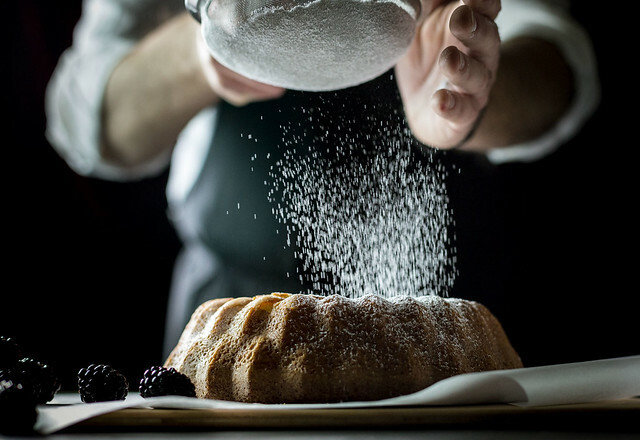 Pour the batter into the prepared bundt pan and tap a few times on the counter to release excess air bubbles. Place the bundt pan on a baking sheet and place in the oven. Bake for 35-40 minutes or until it passes the clean toothpick test. Remove the cake from the oven and cool on a wire rack for 15 minutes before inverting it to release the cake. Allow the cake to cool completely before adding the glaze. Add the confectioners' sugar, cardamom, and corn syrup to a medium bowl. Whisk in the heavy cream, one tablespoon at a time, until a thick, pourable consistency is achieved. Pour the glaze over the cooled cake, coaxing a bit over the sides as necessary to get the desired drips. 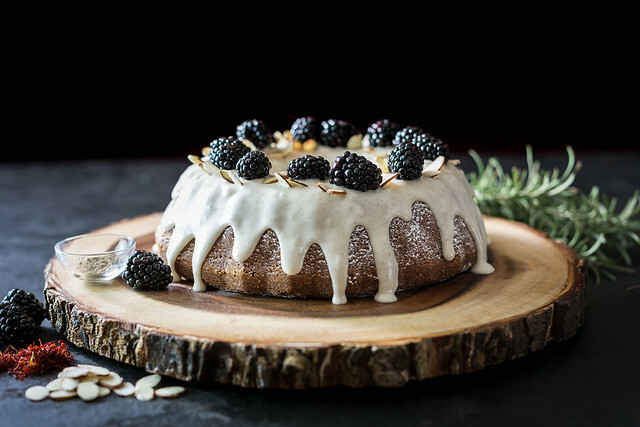 Top with blackberries and almond slices while the glaze is still wet. Store in an airtight container.